Our target is to minimize odours. If you smell something you believe is related to an RDN facility, we encourage you to report it as soon as you can so we can investigate the cause and potentially relieve the odour. Investigations look at wind direction, plant activities and other events in the community. Most odours from wastewater treatment are caused by the breakdown of partially digested food. The most of the unpleasant odours are from food containing nitrogen or sulphur. For example, proteins produce particularly unpleasant odours since all proteins contain nitrogen and some also contain sulphur. In contrast, carbohydrates and fats do not contain nitrogen, but some contain sulphur. What Is Being Done To Control Odour? 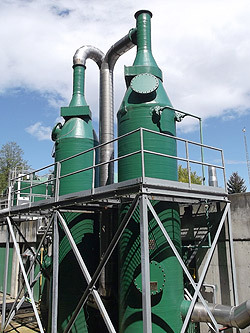 Air from grit tanks, solids contact tanks, biosolids digestion, and biosolids dewatering is captured and treated with biological and chemical scrubbers and bio-filters. New odour controls are being added during the Secondary Treatment Upgrade Project. Every year around March, herring spawn off the shores near French Creek. Roe wash up on nearby beaches and decompose into the summer. The decomposing eggs release hydrogen sulphide and winds can carry the odors towards the highway and FCPCC. Occasionally, odours detected around FCPCC are caused by herring roe. View past stories from CTV News and CHEK News for more details.